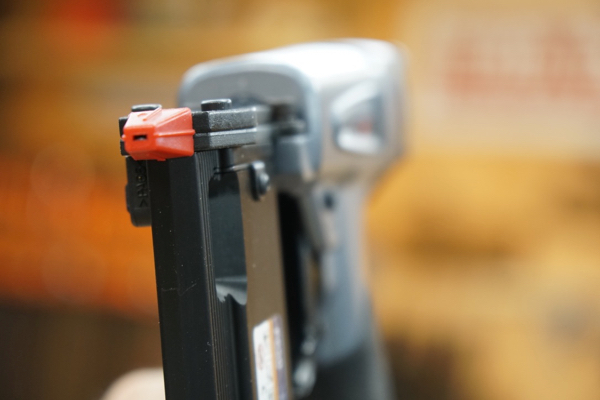 We recently took a look at the Everwin Pneumatic Pin Nailer P650. Everwin nailers are fairly new to the market, and have been building their catalog of pneumatic nailers and staplers, since 2012. Everwin tools are made in Taichung City, Taiwan. This is the same city where Bostitch pneumatic nailers are manufactured. In fact the Everwin engineers used to work the factory that made nailers for Bostitch. When Bostitch bought the factory, these engineers stayed on for the transition and then had to comply with a 3 year non-compete. 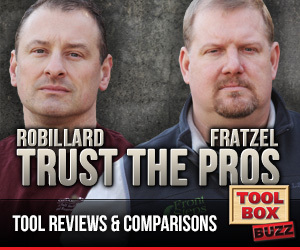 In 2012, after their non-compete expired, these veteran tool engineers realized they could manufacture a pneumatic nailer, comparable in quality to products from Bostitch, Hitachi, MAX and others of the like, but without the vast overhead their competitors embrace. So they started Everwin Pneumatic Corporation, and started manufacturing pneumatic nailers in a factory, also located in Taichung City, Twain. 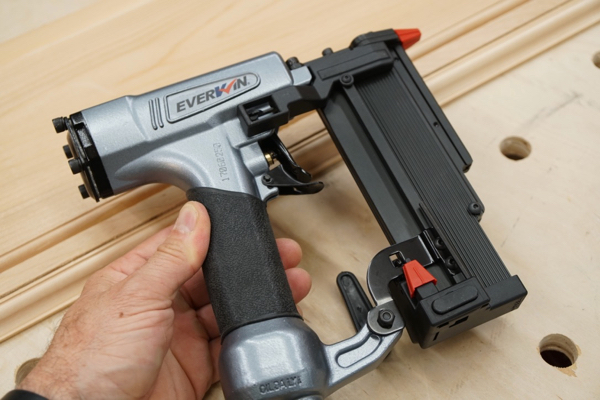 Everwin claims that their nailers are built to match contractor and assembly manufacturer quality, but at a discount price. Anything that is marketed as “discounted,” usually has a connotation of being cheap. While their core focus has been industrial manufacturing nailers they are now working toward commercial nailers – hence the new pin nailer. Everwin does manufacture some “private Label Tools,” but told me that 95% of their tools is now being manufactured with the Everwin label. When I first started out as a carpenter and woodworker all I could afford for my wood shop was Grizzly and Reliant tools. They were considered cheap, reliable tools. The Grizzly power tools were considered cheap and disposable. At the time these tools were considered knock-offs of Delta, Powermatic and other power tool designs and worked well enough of a third of the price. 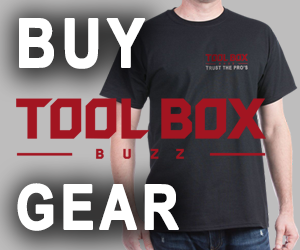 Generic tools have their place but I am a firm believer of you get what you pay for. I feel that the common thread between a quality product and a bad product has always been whether the designer of the product is involved in the manufacturing process. Their passion or design intent keeps the quality up. 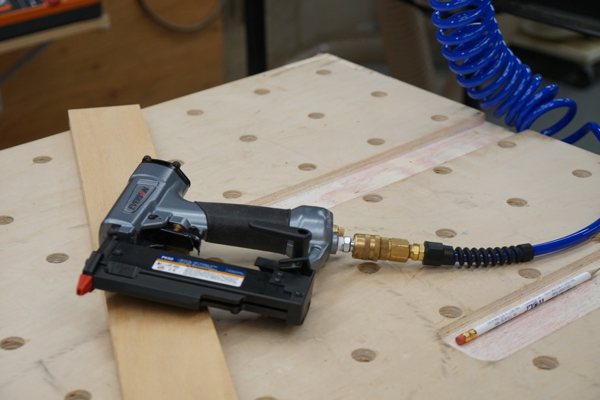 The Everwin Pneumatic Pin Nailer P650 is brand NEW 23 gauge pinner, and will be launching in stores this month. It is an oil nailer and looks a lot like a MAX 23 gauge micro pinner. The Everwin appears to be a well-made pin nailer, featuring a comfortable rubber grip, rear exhaust, double trigger and anti-dry fire mechanism.. It measures 1.8”x 8.9” x7.9” is lightweight at 2.7 lbs. and is well balanced. The Everwin Pneumatic Pin Nailer P650 operates between 70 – 110 psi. I ran it at 90 psi in my shop and had zero difficulty installing 1/2” to 2” pins into framing material, oak and mahogany. This is a no-frills nailer there are no special bells and whistles. With that said it consistently set pins at the same depth regardless of the material I used and I did not have to raise the psi to do it. The Everwin Pneumatic Pin Nailer P650 can install pin fasteners from ½” to 2” long. The magazine for the tool opens easily and smoothly. 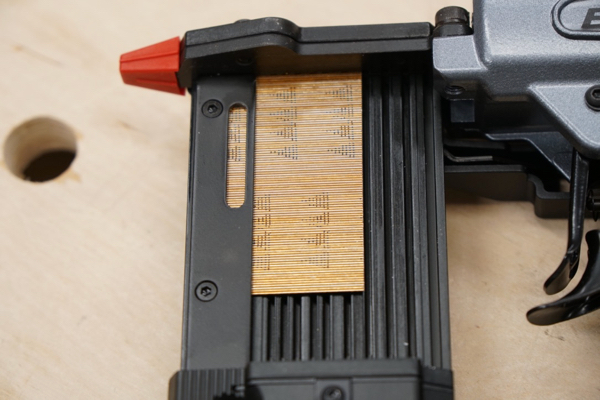 Spring loaded pins in the magazine carriage ensure that the pins are indexed and aligned properly. There is a fixed nose on the tool, and a double trigger, one as safety and the other to actuate to tool. There is no safety on this nailer and it will fire without contacting the surface of the wood if the two triggers are activated. It’s my experience that pin nails do not typically jamb. Everwin entertained a tool less nose but decided against it. 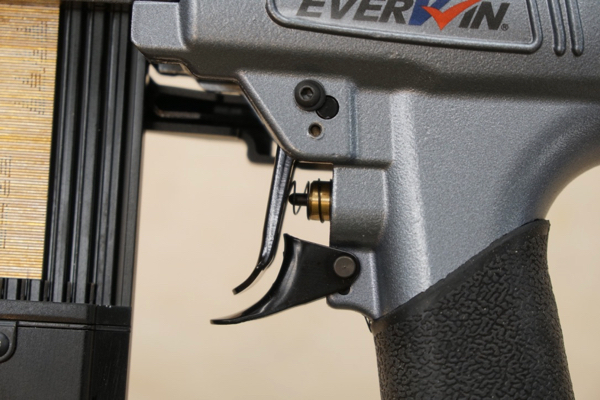 The Everwin Pneumatic Pin Nailer P650 features a dryfire lock out at 5-6 pins. There is a feature to override this lock out. 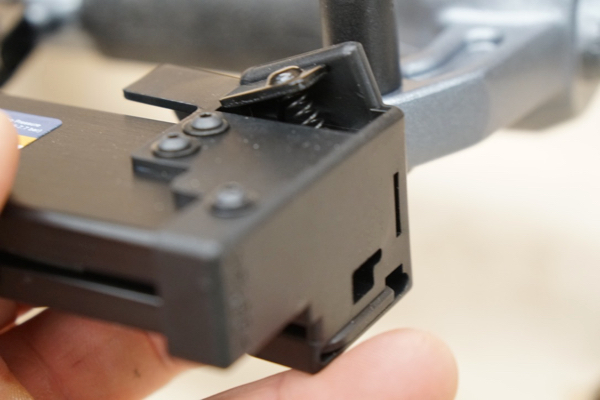 Located on the right side of the tool is a black plastic guard [shield] that covers a small square metal tab. If the operator depresses and holds down this tab they can override the lockout feature. The Everwin Pneumatic Pin Nailer P650 is estimated to cost $150 to $200 but it’s too soon to tell. At that price they’re looking to align themselves with MAX, Bostitch and maybe Porter Cable. 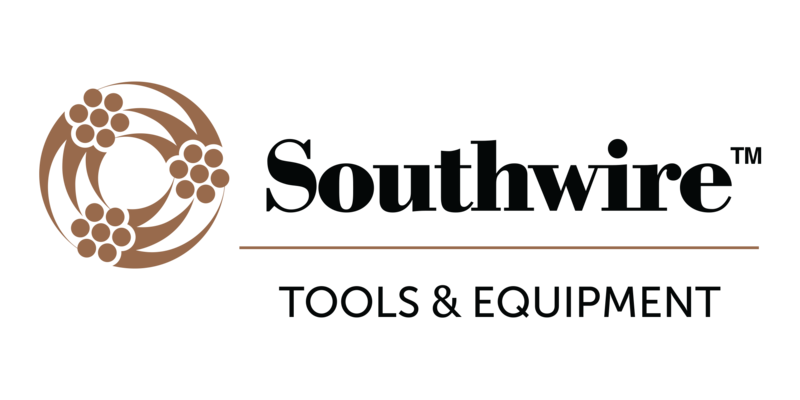 Currently Southern Carlson is handling their distribution and Everwin is working with other STAFDA and industry channels like ACME and Harbor Freight for additional distribution. What Does Everwin’s Future Look Like? This nailer will install 3-1/2” nails and be the MOST COMPACT nailer on the market at 13-1/2” high. Weighing 6.6 lbs. Everwin says that this nailer is constructed with magnesium and will be the lightest pneumatic framer on the market. It will be 20% lighter. To give you a comparison the popular Bostitch N89C framer weighs 9lbs. 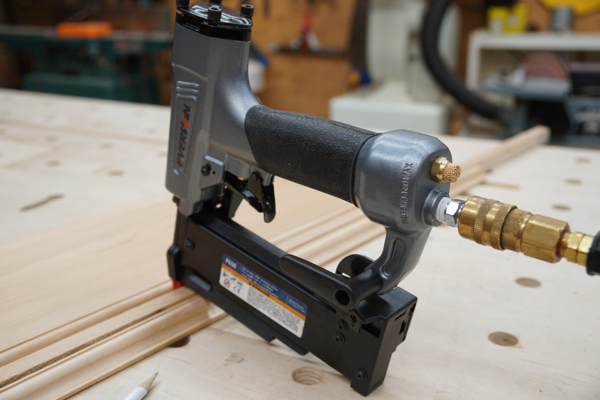 A simple durable nailer to complete their framing lineup. Future Everwin finish nailers will have a tool less feature but it will be located on the rear of the tool. 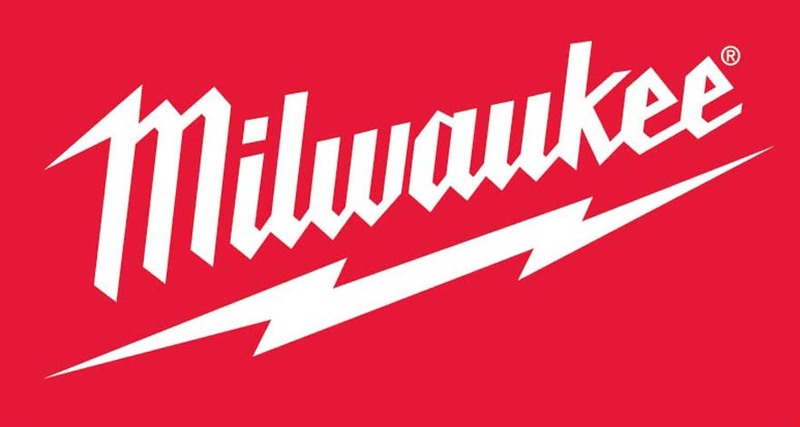 The reason for this is that Everwin’s design experience started with factory / manufacturing nailers and that experience has shown that those nailers tended to get bumped, resulting in nose damage. 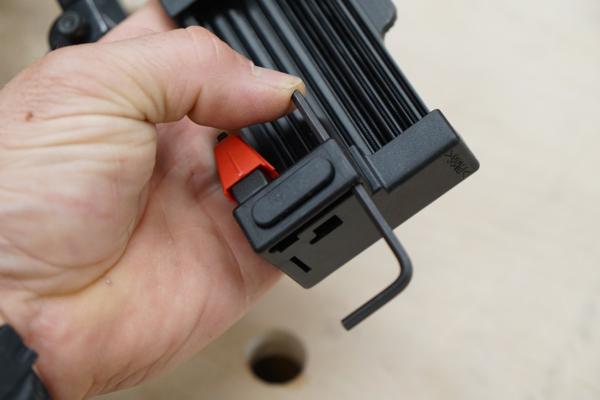 Everbridge’s plan to locate the latch mechanism on the rear of the tool is based on past experience and their desire to make an enduring and lasting nailer. The manual that Everwin sent me was missing a lot of useful operating information and did not have Everwins name or logo on it. Indicating a peel and stick manual. Everwin assures me that I received an early version of their operator manual and they will rectify that. The Everwin Pneumatic Pin Nailer P650 performed well in my shop. I did not have any jambs or misfires and time will tell if this new pin nailer will make it into the big leagues. One thing for sure is that Everwin is working hard at developing market hold and getting noticed. We’re certainly watching. Recently had van broken and over 7000/bucks walked off. Putting together my grabngo dedicated tool packages and taking advantage of some upgrades. This pin nailer is one of them. Already have 2/of the Everwin Ultra-Light Framers and can’t say anything but WOW. Whatta difference the shedding of weight makes on performance and your body. And lets not forget balance and power as well. Excellent depth setting nose with removable no mar tip with on gun storage which is ideal for the small siding jobs we do for roof top access / additions.